US President Donald Trump’s comments against Iran and the Iran nuclear deal known as the Joint Comprehensive Plan of Action (JCPOA) continue to draw extensive reactions. 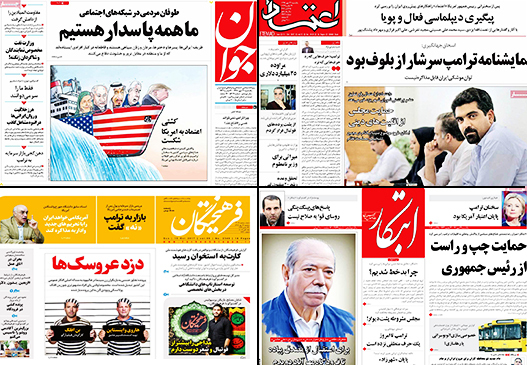 Editorials and articles in Iranian newspapers on October 14, 2017 still focused their attention on Trump’s policy on the JCPOA. The articles offered solutions to the problems surrounding the JCPOA. In the meantime, some believe that Iran has lost a golden opportunity to benefit from the JCPOA. The Jomhouri Eslami daily has, in its editorial, underlined that Trump’s speech and statements by leaders of European countries have given Iranian authorities a chance to boost the trend of implementing the JCPOA. The newspaper proposes Iranian officials remind European leaders of their anti-Trump stances and urge them to implement the remaining provisions of the deal. After the conclusion of the agreement, European countries and EU officials entered into positive interaction with Iran. And now Trump, with his clumsiness, has provided an ideal opportunity for European leaders to fully recertify the agreement. This can give the implementation of the JCPOA a fresh impetus, though it runs counter to Trump’s intention, which is to slow down its implementation. Abdollah Ganji, the editor-in-chief of the Javan newspaper, has explained why no one can convince Trump. “When no international institution, including the International Atomic Energy Agency, Europeans, the UN Security Council and even Zionists, has denied Iran’s compliance with its commitments, Trump cannot be regarded as logical. The Iranian nation wholeheartedly understands the reason behind Trump’s rhetoric and refers to remarks by the late Imam Khomeini and the Leader who have said the US seeks to make us leave our identity behind,” writes Ganji. Ganji goes on to say that Trump has turned into a tool for Iranian people to get to know the reality of the United States. “Trump has a mission to put an end to the cautious optimism that some individuals have in Iran. Trump is commissioned to create utmost unity in Iran. This stupid person does not only make threats; rather, he provides numerous opportunities as well. Take his predecessors (George W. Bush), for instance. Bush removed Saddam Hussein from power in Iraq, but saw those favouring the Islamic Revolution taking the helm of affairs in Iraq. Finally, the US left Iraq with 4,500 fatalities,” Ganji adds. Mohammad Sadeq Janansefat mentions an important point in an article he has written for the Jahan-e San’at newspaper. He believes Iran has lost a key opportunity to take advantage of the JCPOA over the past few years, and now that Trump seeks to halt Iran’s economic progress and probably impose new sanctions on the country, Tehran will find itself in a tougher situation. “The easy days of the last two years have passed, and now we should fasten our seat belts faster than ever. If Iran can convince the European Union, Japan, South Korea and certain other countries, one can be hopeful that Iran’s economy will not run out of breath and things will go smoothly as before. Otherwise, a solution needs to be worked out. Heads of Iranian chambers of commerce had meetings with foreign delegations and saw those foreign teams were not coming back after their meetings. I wish the Iranian officials would ask the foreign delegations why they would not return to Iran, and after they got the answer, they would inform the higher-ups in the country. Maybe the only thing we can pin our hopes on is the competition among giant companies in the world. As things stand, Iran cannot hope to be able to attract foreign investment unless it offers more concessions,” writes Janansefat. In an article published in Ebtekar newspaper, Jahanbakhsh Mohebinia says there is a possibility that Trump is not seeking to annul the JCPOA, but wants to get more concessions from Iran. According to the analyst, Trump does not want to scupper the nuclear deal; rather, the US president may be trying to put himself in the spotlight as a national JCPOA hero by putting forward the “lunatic man” scenario and ratcheting up the pressure on Iran. Hamid BaeIdinejad, Iran’s ambassador to Britain and a former member of the Iranian nuclear negotiating team, has also written an opinion piece for the E’tmad daily. He argues that Trump cannot carry out his threats. “Trump did not say that it is the major differences between him and his allies that have isolated him. First, heads of three European states, namely Britain, France and Germany, in a statement, voiced their opposition to Trump. Afterwards, Mogherini together with leaders of Russia, China and other countries expressed their opposition to Trump’s comments as well,” he writes. “With so much rhetoric which suggested his wrath over the IRGC’s effective role in fighting terrorism, Trump declared whatever restrictive measure he could think of against the IRGC. But despite all this rhetoric, he did not dare announce that the IRGC has been put on the US terror list, something that he had already announced he would do,” he further wrote. Mohammad Zaeemzadeh also in an editorial published in the Farhikhtegan newspaper seeks to decode Trump’s policy vis-à-vis Iran. The analyst believes the US government is trying to create social and economic rifts in the Iranian society, so that it can deal a blow to Iran. Zaeemzadeh warns proponents and opponents of the JCPOA inside Iran to stop using extreme definitions or harsh criticisms of the JCPOA in order to counter the US scheme, and to seek convergence and solutions to the existing problem.